The 1st step towards exporting your Revenue is to do a (one-time) set up between Jackrabbit and QuickBooks. This is done from the Tools menu > QuickBooks Export. Before you begin, ensure that you have an Undeposited Funds account in your QuickBooks Chart of Accounts. For more information on the Undeposited Funds account have a look at our Help article Undeposited Funds & the QuickBooks Bank Deposit. From the left menu select QuickBooks Online Export and click Connect to QuickBooks. You will be prompted to sign into your QuickBooks account and Intuit QuickBooks will ask you to verify your information with a code sent either as a text or an email. This is to ensure you are who you say you are in order to keep your account safe. When you are signed in, a pop-up window will open and you will be asked to authorize Jackrabbit to connect to your QuickBooks file, click the blue Authorize button to complete the connection. Once Jackrabbit is connected to QuickBooks another window will display a confirmation that the connection was successful. Your database is now connected to your QuickBooks account and will remain so until you disconnect it. 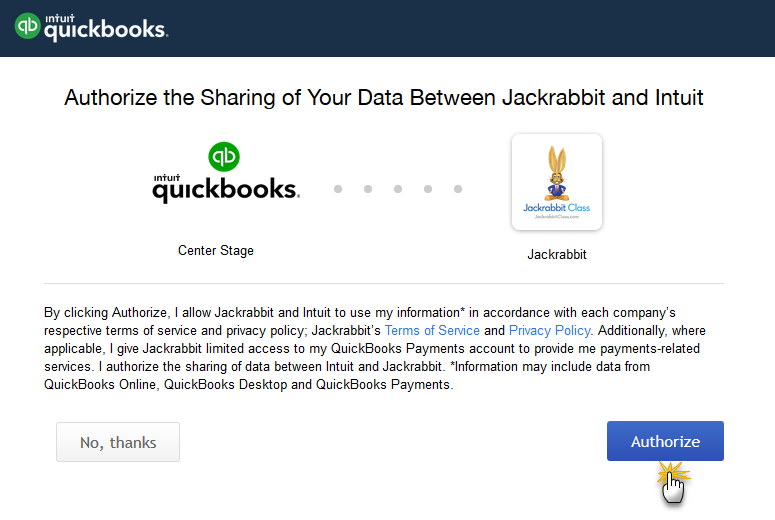 If you wish to end the connection between Jackrabbit and QuickBooks click the Disconnect QuickBooks Online button (only displayed when the connection is active).